A social security number is issued by the United States Social Security Administration (SSA). This government-issued credential is a unique identifying number (SSN) that U.S. citizens, and some non-U.S. citizens, need for several significant purposes. To begin with, you must have a social security number in order to obtain a job. A social security number is also used to identify employees for tax purposes and eventually is required for receipt of social security retirement money. Your social security number is also used by some other government services and by banks and credit issuers as a form of identification. Historically, before identity theft became so prevalent, your social security number was used by everyone from universities to be used as your student ID number to energy companies, telephone service companies, and even libraries. In order to successfully apply for a social security number and card, you will need to bring certain documents with you to your local SSA office. These documents show proof of your age and your identity. To prove your age, you will need your birth certificate. You must also establish your identity. The SSA accepts identification documents that are current, that contains your name, other identifying information, and a recent photo. The documents that you use to prove your age and identity must be originals or copies that are certified by the agency that issued the document. You will receive your social security number and card as soon as the SSA has verified your documents at an issuing office. 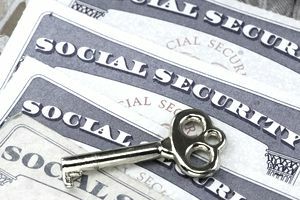 What Does My Employer Do With My SSN? Your social security number is supposed to be unique, and as long as no one has stolen it, it is. So, if you change your name, your social security number still stays the same. Your employer will run your number through their database to see if you worked there previously. You may think is a silly step, but a lot of companies merge or break off into different companies that then go by other names. You may be applying for a job at a large corporate entity you've never worked for, but you'll still be in their system if you previously worked for a small business purchased by this big company. Legally, your employer has to withhold taxes and any court-mandated deductions. For instance, child support, back taxes, or other judgments against those. Your social security number is what ties all of them together. When they withhold taxes from your paycheck, the taxes are attached to your social security number. Your number needs to be accurate for you to receive credit for the work you do. When you retire, your social security payments will come from the money you paid into social security during your working days. If your job involves finances or other sensitive information, your potential employer may use your social security number to run a credit check. Legally, you have to sign a release form in order for them to perform the credit check. If you've had problems with identity theft, speak up before they run the report. That way, they aren't surprised when it comes back looking a bit haywire. If you're upfront with them, most likely they'll be willing to work with you to determine your actual risk level. If you're job hunting and have any doubts about your social security number, it's worth looking into the various circumstances that might necessitate you'll have to provide your social security number.